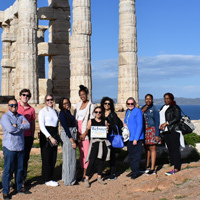 Among many who took advantage of Webster's unique short-term study abroad programs over spring break were the 11 students who went to Greece as part of the hybrid "Commerce in Athens" course, which brought a mix of undergraduate and graduate students together from all across the United States. Meeting in person for the first time since beginning the primarily online class, they visited merchants and businesses while also taking in the historic beauty of "the cradle of western civilization." 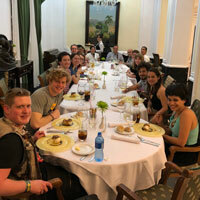 During the spring break, 33 students participated in various short-term faculty-led trips to Athens, Greece; San Jose, Costa Rica; Havana, Cuba; Quito and Galapagos Islands, Ecuador. These programs are designed to enrich the curriculum by giving students a learning experience outside the classroom, and allow them understand the world around them. 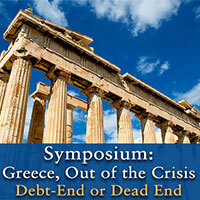 Vienna will host a symposium entitled, "Greece, Out of the Crisis: Debt-End or Dead End," on May 17. Organized by Nikolaos Antonakakis, head of the Department of Business at Webster Vienna, the symposium will draw leading economists to Webster to consider the background of the crisis, its current state, and weigh radical solutions. 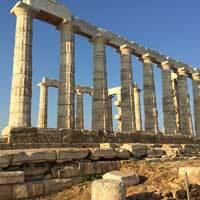 Faculty and students are invited to an open house to meet with our visitors from Greece on Monday, April 24 from 4:30-5:30 p.m. at The Global Exchange in Sverdrup 107. Webster-Athens’ Vasilis Botopoulos, chancellor and managing director, and Susie Michailidis, vice chancellor for academic affairs, will be available to speak about their campus, their offerings and opportunities for both faculty and students.